This was the card we journeyed into on the workshop I delivered for the Tarot Association of the British Isle conference last weekend. It was a great couple of days and I felt you all might like to receive the handout from the conference here. The main figure is Nuit – the sky goddess manifested in physical form. She bridges the gap between the spiritual realms and the Earthly realm. Much of the symbolism on this card is concerned with this concept. The water in the background is the sea of binah – high up on te Kabbalah, the crystallised forms are the energy of Binah being crystallised and coming down the pillar of mercy to physical form, so again an image of spiritual reality becoming a physical reality – the manifestation of heaven on Earth. Nuit pours her water from the golden cup of the soul onto herself and then allows this light and love to flow through her to be delivered to the earth through the silver cup below. Snuffin likens this to the incarnation of our soul onto Earth. The water fertilises the earth and from this the energy of spirit is harnessed and used for growth on the Earth. It is also a symbol of renewal and the idea of inexhaustible nurturing. That state we can come close to experiencing when we seek our own source of renewal, comfort and love from spirit rather than people so we can then give more to others and be less attached to the judgments Earthly people and realms place upon us. The seven pointed star of Venus is shown on the Globe represents the love in this card as does the roses below. The butterflies show the lightness of spirit (and there are 5 of them – spirit is 5th element) and the transformation power of this card – change through joyfulness rather than the struggle, pain or destruction that is seen in other cards. The Globe itself is the celestial skies we see from Earth so there is the sense there is so much more beyond this and this gives us the intensely spiritual and vast feel this card has. 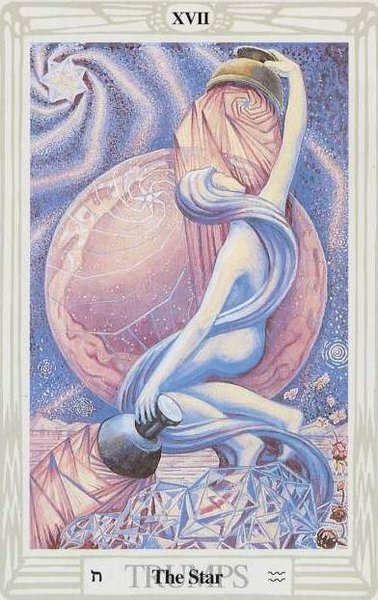 The card is associated with Aquarius which is a sign concerned with innovation, inspiration and the positive advancement of the human race, all things connected with ‘saving the planet’ originate with this Aquarian energy of inspiration. The action is started through this card, and continued on often through more earthly energies. So with both a representation of Venus and Aquarius this card can also be considered to represent an unconventional relationship – one where friendship is strong and there is a great deal of independence and freedom within it. Higher ideals are held above the need to be together. The star behind sends out rays beyond even what we can see – so this card is showing what we see manifest is only a small portion of the spiritual energy in action and available – there is an abundance of spiritual help and love . This card shows a time where you are able to put dreams into action. Also a time where your own inspiration and higher self guides you more than the opinions for others. A time where you are doing the work you are here on the planet to do. I governs all work about making the planet a better place and being more in harmony with the natural world rather than. Your chanelling ability is at a high point and much of your inspiration may come from dreams and reveries. As mentioned above the relationship you are in is unconventional and involves the need for large amounts of independence for each person – there is loyalty though and love of a spiritual kind though at times you may feel that passion is lacking. You may however have join tasks together which benefit the wider community. Your relationship provides an opportunity to reach higher than you have been able to before in your spiritual connection. You may find yourselves working together in activities which enhance the ability to channel spirit and to receive intuitive information and then act on it to improve your life together overall. Allow your positive relationship to touch all other relationships around you – be involved with the wider community so you can share your insights and ideas and spiritual love with all those who can benefit from it. Take time in meditation to receive insights about your life together – share your insights with each other and act upon them. You may find they require some increased distance in your physical connection – however the love you share will remain strong despite any increased independence. How can you trust your self more in your life? What inspiration are you I drawn to act upon right now? Where do you fear letting go so you can be more independent? Are you ready to deal with this now? What transformation through joy do you need to embrace right now? Are you ready to let go of looking to people for approval and look to spirit instead? What are you being called to do now? Does your intuition say you need to work more closely with your partner on a project or do you need to follow your own insights more? Write down all the inspirational ideas you have at this time, so you can begin to bring them into being. Answer the above questions – if necessary draw more cards to come to clarity about them. Meditate every day to cleanse yourself and tune to the highest energies. Focus on trusting that everything you do is the right thing to do at that time.